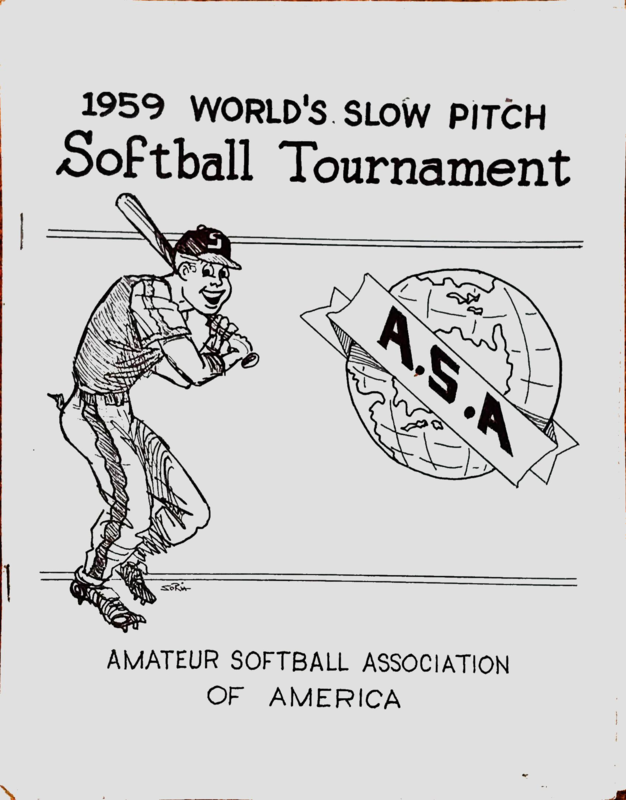 1959 held at Richmond, Virginia. Pitcher Polly Russell of Pearl Laundry had plenty of offensive support as her teammates provided her with 69 runs scored in the 3 games they played and Russell did her part twirling 2 shutouts along with the 10-4 Championship game win. Richmond got 4 runs in the first inning, then Player-Manager Pete Brown hit a HR in the sixth inning to pull the Glass Rockets to within 6-4, but Pearl Laundry scored 4 more runs on 4 hits to make it 10-4 in the seventh. A performance of note was the pitching of the Carolina Glass Rockets Maxine Palmer, who threw a 1-hit shutout in eliminating Garvin’s Grill 1-0. Garvin’s had been the National Runner-up the previous two years. Yorkshire won their first two games, then lost to Grande-Caruso of PA 11-2. 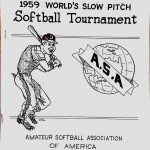 They then won the next seven straight games behind the pitching of Walt Wherry, who only surrendered 27 runs in the final 7 games of the tournament. 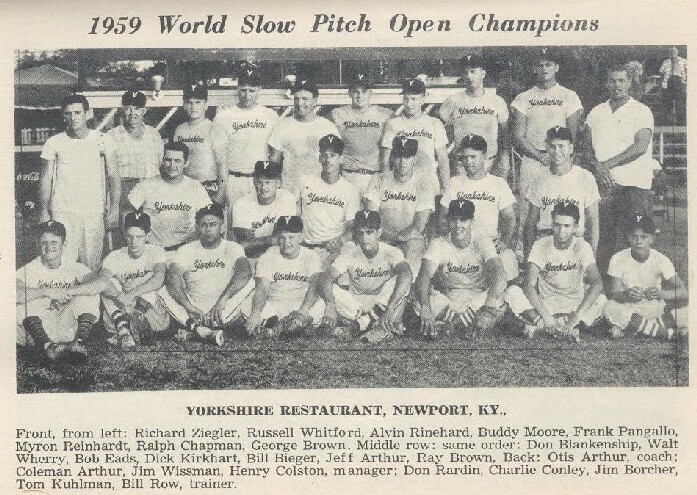 In the losers bracket semi final, Yorkshire came back to win in dramatic fashion as Don Rardin’s 3 run homer late in the game, beat Sheffield Bronze 3-2. They then got their revenge on the Grande-Caruso squad with a 6-4 win in the losers bracket final then had to defeat undefeated Duffy’s twice. Duffy’s had beaten New Kensington’s Grande-Caruso 8-6 as Ish Cornett’s home run with brother Al Cornett aboard iced the game in the last inning. Yorkshire Restaurant became the first team in the history of the Slow Pitch Nationals to come through the losers bracket and win the title. The first final was over quick as Yorkshire won 11-1. 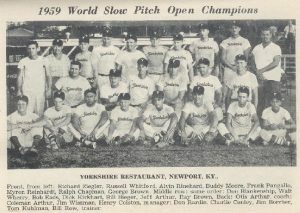 In the 10-6 final, Yorkshire jumped out to a 5-0 lead and never looked back as Myron Reinhardt delivered a 2-run homer with Rardin aboard. This was followed by consecutive doubles by Walt Wherry and Bill Beiger, along with singles from Coleman Arthur, Tom Kuhlman and Ralph Champman for 3 more runs. Wherry had a single, double and a triple in the game, while Reinhardt had a Homer and 2 singles. Yorkshire picked up Myron Reninardt and Walt Wherry from Gatliff for the Nationals.